The CBSM-2510 0.5 sub-micron filter filters and reduces VOCs, Cysts, Pesticides, Chlorine, Taste and Odor for great tasting water. A perfect filter for perfect drinking water and compatible with any system using standard size 2.5" x 10" filters. This filter is the OEM replacement for the following systems: CNTP-1W countertop drinking water systems. CNTP-1C countertop drinking water systems. U200 Under-sink drinking water systems (2nd stage filter). Also uses CB5-2510 for 1st stage filter. U200UV Under-sink drinking water systems (2nd stage filter). Also uses CB5-2510 for 1st stage filter. U300 Under-sink drinking water systems (3rd stage filter). Also uses SD1-2510 (1st stage) and KDF05-10 for 2nd stage filter. U300UV Under-sink drinking water systems (3rd stage filter). Also uses SD1-2510 (1st stage) and KDF05-10 for 2nd stage filter. Temperature Rating: 40F to 180 F (4.4 C to 82.2 C). Maximum Operating Presssure: 250 PSI. Maximum Differential Pressure: 100 PSID. Collapse Pressure: 200 PSID. Materials of Construction: Carbon: Coconut Shell Activated Carbon. Netting: Polypropylene. End Caps: Polypropylene. Gaskets: Neoprene. Outer Wrap: Polypropylene. WARNING: Do not use with water that is microbiologically unsafe or of unknown quality without adequate disinfection before or after the system. NOTE: Performance capacity depends on system design, flow rate and certain other application conditions. After installation flush the cartridge for 2-5 minutes to remove all traces of fine particles before using the water. Micron ratings based on 85% or greater removal of given particle size. 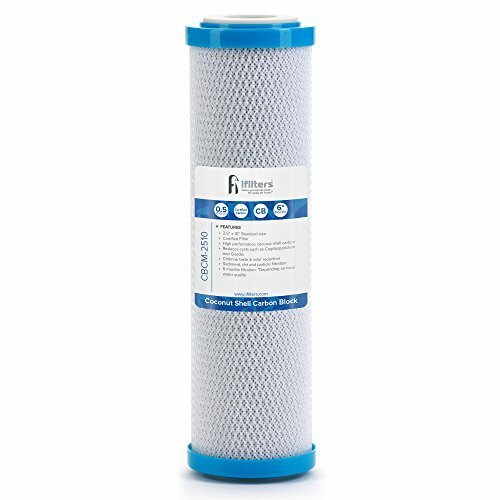 2.5" OD and an overall length of 9-7/8"
If you have any questions about this product by iFilters, contact us by completing and submitting the form below. If you are looking for a specif part number, please include it with your message.